We recently surveyed our growing panel of smartphone consumers about their video consumption habits, and it’s clear that the smartphones are starting to keep pace with desktops and laptops as the method chosen to view video. 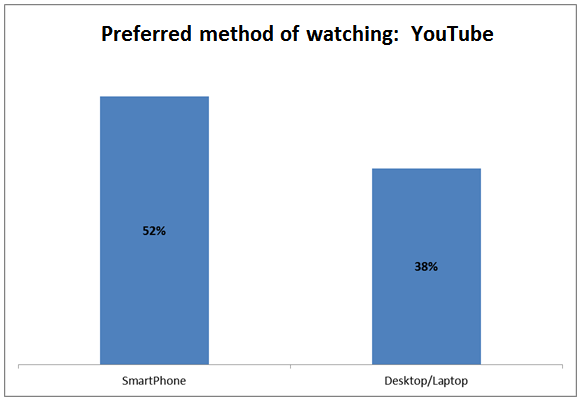 Polling over 400 consumers, we asked how many had watched some form of video on their smartphones in the last month. Responding by type of video watched, 97% of those surveyed watched at some kind of video content. That isn’t too surprising. 91% of those surveyed find watching video on a smartphone enjoyable, with another 94% calling the act ‘convenient’, and 87% finding the activity ‘easy’. 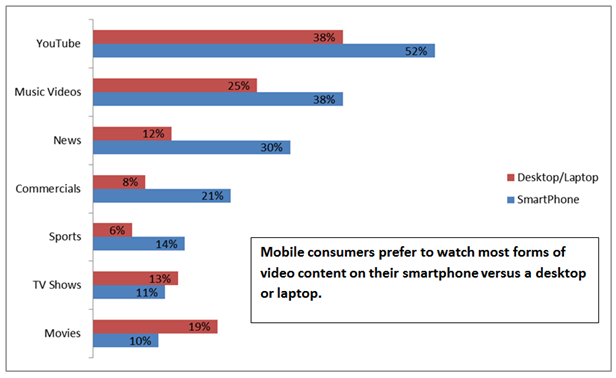 But, when asked about ‘most preferred method of viewing’ specific types of video content, things got very interesting. For instance, despite enjoying viral success that originated on the ‘desktop/laptop internet’, 52% of consumers who watch video content on YouTube now prefer to use their smartphones to view the content. It doesn’t stop there. The fact is mobile consumers we surveyed called the smartphone the preferred method of viewing versus desktop & laptop for every type of video content, besides television and movies. This sort of makes sense, don’t you think? The fact that consumers prefer to watch movies and TV shows on the desktop or laptop might lie in the fact that the content itself requires longer to consume, and the small screens of most smartphones are very likely a big factor as well. Helping underscore this theory is the finding that desktops and laptops aren’t the only viewing modes taking a hit from the smartphone; television is losing the news audience to smartphone viewers too. 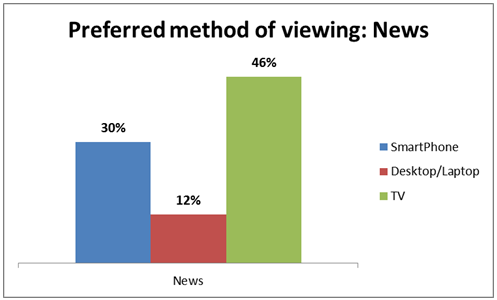 As our study reflects, the percentage of viewers who now prefer watching news on a smartphone is in even greater proportions versus television, than those who prefer to watch on desktop or laptops. Overall, the smartphone seems to be taking on viewers any time the content doesn’t rely heavily on large screens and/or high quality for proper enjoyment. TV still reigns supreme in the areas of TV Shows, Movies, Sports and even commercials. As for desktops and laptops? My prediction is that where smartphones haven’t already surpassed them as the preferred video viewing platform, increasing ownership of tablets and more new & lower cost tablets on the horizon will probably signal a near complete displacement of viewership. 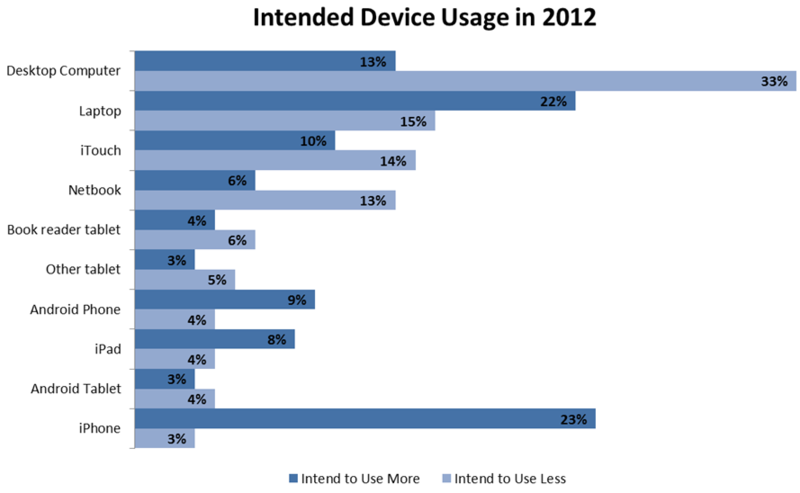 A recent SurveyApp survey we conducted among our mobile consumer panel, revealed that nearly a third of all iPhone users plan on beginning to use an iPad in 2012. Those same respondents believe that 2012 will also signal a marked decrease in their use of a desktop computer. Interestingly enough, it appears that the iPhone, aside from displacing more ‘traditional’ digital device usage, is also displacing other Apple devices, such as the iTouch, which perhaps becomes a bit redundant after the purchase of either the iPhone or the iPad. As we approach the holiday season, it will be interesting to watch how the release of iPhone 5 and overall evolution in the smartphone marketplace continue to erode at traditional computer usage. Here’s a visual look at the data. Of similar interest is the high percentage of those surveyed, over 30% who intend to begin using an iPad, and over 10% who intend on using some form of tablet. While this doesn’t speak directly to purchase intent, it seems logical that by means of purchase, gifts, or other means, these devices will fall into the hands of a lot of people. Conversely, laptops, desktops and netbooks ranked low on the lists for the upcoming year, and I can’t help but wonder if this isn’t also the harbinger of lower sales for this class of computing device. With the holiday season right around the corner, will 2012 be the year of the tablet? The death of the desktop? Stay tuned for more on this story over the next few months!